I know some of you will laugh at this statement – you’re thinking, how can having the cream of beauty products at your disposal be a bad thing? – but one of the downsides of my job is that my skin never really gets a chance to settle down, and over the years, it has definitely become more reactive and dehydrated. So when I was invited to Skin3 to experience a personalised Environ facial and skin analysis, I jumped at the chance. I’ve had one other Environ facial in the past and it was one of a handful of facials that left me feeling confident enough to face the world with my head held high, as my skin looked amazing. 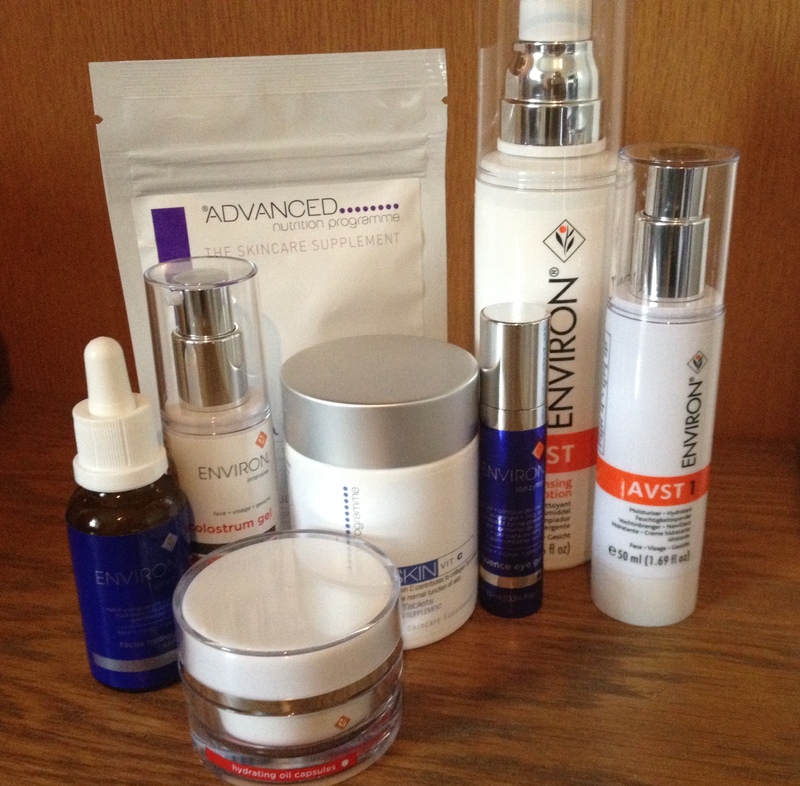 For those of you who aren’t familiar with Environ, it is a cutting-edge cosmeceutical range from South Africa that includes high doses of vitamins A, C and E plus antioxidants, growth factors and peptides. The products are clinically proven to dramatically improve skin. Skin3 is part of the IIAA Group (Institute for Anti-Ageing) and their approach is completely results-based. They also have the ‘before and afters’ to prove their good work, and many celebrity clients which we’re not allowed to talk about on here! 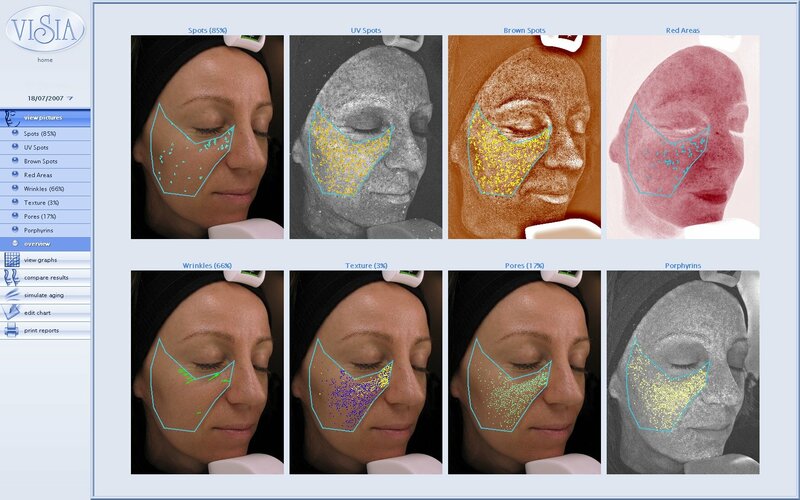 My treatment began with an in-depth consultation and skin scan using the Visia skin imaging machine (below – that’s not me in the pictures BTW). I’ve had my skin analysed numerous times before but never anything this thorough. The scan reveals the condition of your skin below the surface, and in my case showed dehydration, redness/inflammation, bacteria and fine lines around my eyes. It also told me how good or bad these elements were compared to others my age. It wasn’t all bad news though, as my skin seems to be fighting the ageing process pretty well. The fascinating, and slightly scary part was seeing the machine visibly age me by a few years, to demonstrate how my skin would change/age should I carry on with my normal skincare routine, which obviously isn’t cutting the mustard (oh dear). 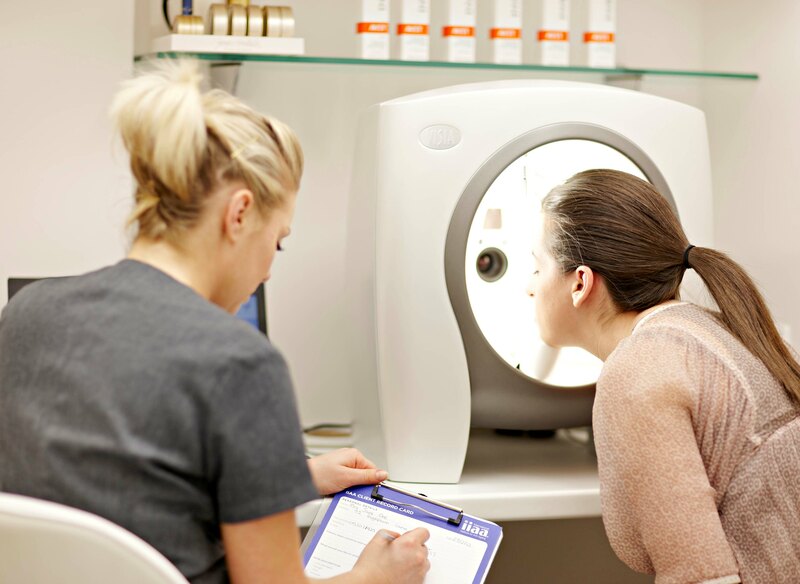 The Environ Active Vitamin Treatment (1 hour, £79) began with a pre-cleanse, followed by a cleanse and tone to remove all traces of dirt and impurities. A cream to suit my skin was applied in conjunction with a method called sonophoresis; this uses sound waves to transport the product through the skin and works better than conventional ultrasound, penetrating 44oo times deeper. Vitamin A serum was followed by a thick mask – this was then hooked up to another machine that gives out an iontophoresis current, which passes through the skin to encourage greater penetration of vitamins into the skin. While I didn’t feel anything, I did have the slightly strange sensation of lights getting brighter and dimmer, even though my eyes were closed. The other weird thing was that the mask covered my mouth so I couldn’t speak – not ideal for the claustrophobic. While the mask was on (for around 15 minutes, I think), my brilliant therapist Anisa gave me a wonderful hand and arm massage which helped me relax a bit. The mask was then peeled off and more creams were applied, plus an SPF. Environ really does seem to suit my skin (but it may possibly suit everyone), and at the end of the treatment my skin looked calm and clear. A light dusting of mineral make-up gave an additional boost and prepared me for a late afternoon meeting. Once again, this was a really positive Environ experience – I’ve started using the products exclusively for now, and will let you know how I get on in a month or so. Stay tuned! 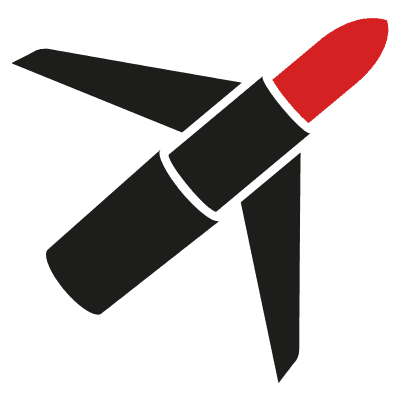 Skin3 is at 41 Fairfax Road, Swiss Cottage, London NW6 4EL. Tel: 020 7328 1291. www.skin3.co.uk.